I was recently approached by Stacy Schlicht from the firm Rogers & Cowan who are the publicity agent for the film “Expelled: No Intelligence Allowed.” Stacey offered me the chance to interview one of the filmmakers Ben Stein. I accepted the offer, which quickly became a “teleconference” open only to an “exclusive” group selected on the basis of submitted questions. After dutifully submitting my 5 questions I am informed that the teleconference planned for yesterday has now been postponed until the 18th – the planned launch date for the film. The film’s promotion appears to be in disarray – maybe because it faces legal action for copyright violations. It has also faced strong criticism from reviewers who have been shown the film (see Expelled Exposed for links to a number of reviews). There has also been a lot of publicity generated by eviction of scientists from pre-screenings and the outrageous claims made in the film (Darwin is responsible for the holocaust!). While the filmmakers and the creationist colleagues have been arguing that “no publicity is bad publicity” it seems clear that the publicity will reduce the film’s effectiveness by creating a cynical attitude amongst film goers. Christine Castillo Comer who was forced to resign as the Texas Education Agency’s director of science – her crime was to forward an e-mail message on a talk about evolution and creationism. 3: Several spokespeople for intelligent design (eg. Phillip Johnson and Paul Nelson) have admitted that ID does not yet have a theory or even a body of work. Isn’t it, therefore, premature for you to be promoting ID as a valid science? 4: Many of the most active supporters of capitalism have effectively been social Darwinists – monetarists like Margaret Thatcher, for example. The eugenics movement was also very strong in the US and many western democracies. It probably still has many followers in these countries. Shouldn’t you therefore be highlighting monaterists and similar supporters of capitalism as evil results of Darwinism? 5: Richard Dawkins says in A Devil’s Chaplain: “But at the same time as I support Darwinism as a scientist, I am a passionate anti-Darwinian when it comes to politics and how we should conduct our human affairs. … There is no inconsistency in favouring Darwinism as an academic scientist while opposing it as a human being; any more than there is inconsistency in explaining cancer as an academic doctor while fighting it as a practising one.” This would also be the position of most scientists. Does your film explicitly identify this very important position? Stacey also informed me that no screenings of Expelled are currently planned for New Zealand, which in itself suggests that it won’t be the record-breaking success many creationists are hoping for. But a valid question is – why should we bother? Shouldn’t we in New Zealand just ignore the film and leave it to American supporters of truth and science to fight it out themselves? I agree that the issue doesn’t have the same immediacy here. But the film is being promoted by several groups in New Zealand (see for example Expelled: No Intelligence Allowed, Ben Stein Smart Bombs Darwinian Bunker, New Zealand Home Schooling, New ID Briefing Packet for Educators, The first “Expelled” trailers are out…). Once on DVD these groups will no doubt organise showings at their churches. The film may never be shown in New Zealand theatres. However, the very promotion of the film means that the dishonest and libelous arguments used in the film are being promoted locally. These need to be challenged. Will the public ever see Expelled? Should Dawkins have been Expelled? So what does Dawkins think of “Expelled”? This entry was posted in belief, Christianity, creationism, Darwin, Dawkins, evolution, intelligent design, New Zealand, religion, science and tagged Expelled, monetarism, Paul Nelson, Phillip Johnson, Thatcher. Bookmark the permalink. Excellent write-up Ken. Yes, I often think it’s better to just ignore this kind of stuff here in New Zealand but there are a lot of people out there who aren’t aware of the issues and the motivation behind these kinds of films who are likely to swallow this – not just the fundies too. Unfortunately I think in the case of a film like this we have an obligation to make people aware of the dishonesty surrounding it – perhaps it’s a good opportunity to set straight a few common misunderstandings about evolution and how the scientific method works. My sermon this Sunday evening (part 2 of our series on the Apostle’s Creed – ‘Almighty Maker of Heaven and Earth’) will address what I will describe to be the dangers of being ‘anti-evolution’, and how such a position actually limits the Creator. I agree – good on you Dale. Perhaps you can pass on how the sermon, or this part of it, is received. I actually found the comment of Francis Collins on the whole ID attack on science very interesting. He called it sacrilegious -which I guess is something like blasphemous. I think this comes from the Christian concept of a rational creation which can be investigated and understood by humanity. It seems to me (as an outsider) that this approach seems to be ignored (or forgotten) by some Christians. Personally, I would think it important for Christians to fight for that outlook. And it’s interesting that the Wedge outlook seems to specifically attack such theology. And so does the film. Seen in this light the film “expelled” is an attack on what I imagine (as an outsider) is a basic Christian theology. For this reason I would hope that many Christians will dissociate themselves from the film. It’s not in the best interests of Christianity for it to be seen in conflict with modern science. I’ve tried to offer a round-up of the plagiarism subject on my own blog as well. Nice post Ken, interesting that they are seeking kiwi input. I’ve been following this movie since PZ Meyers got kicked out of a preview while his companion, none other than Richard Dawkins, was let in. From most accounts it seems the movie is poorly made from an aesthetic point of view, poorly made from an intellectual point of view, and poorly handled from a PR point of view. The dishonesty in the way they collected information from the likes of Dawkins, Meyers and Shermer makes it even more farcical, and that they are likely to get nailed for copyright infringement is just too ironic. It is depressing that anyone could take this movie seriously lol. A big cheer for Dale too. The ID mob should not be allowed to make Christians look anti-science. The more Christians that stand up to this nonsense, the better. Point well taken regarding the singling out of the ID folks as being squelched and not including the evolutionists however wasn’t the point of the film free speech as much as the ID agenda? Sally – I don’t think the film is about free speech (If it were it would have included people like Comer, Murphy and Colling). The whole point of the film is to attack scientific knowledge – specifically evolutionary science. It’s part of the whole Wedge strategy. Their whole agenda is well documented. I was very pleased about that. One of the problems with the polarised nature of this debate is that one can get the wrong impression about the beliefs of whole groups. I don’t think the “Expelled” message should be seen as a Christian message so it is pleasing that most Christians (in NZ anyway) aren’t taking it that way. Do you know any of the others who were in on the “exclusive” interview call? I wouldn’t be surprised if instead of being postponed until later it was held as scheduled, and they simply uninvited you based on your troubling questions. Apparently that’s how they’ve been handling unwanted reviewers — telling them their local screening is canceled when in reality it happens as originally scheduled. It would be interesting to check with someone else involved in the call to see if it happened anyway. Congrats Ken, you’ve been linked to my second most favourite science blog. “The teleconference interview with Ben Stein is scheduled for this Friday, April 18th 1:00-2:00pm EST (10:00-11:00am PST). Please use the dial in information below to access the teleconference. Perhaps someone could put this to use? I won’t be ringing from New Zealand. Thanks for the note Cedric – wondered why the number of hits had really shot up. Zadig may well be right about the manouvering around this teleconference. Due to a last minute change in Mr. Stein’s schedule he is no longer available at 10am PST time tomorrow. However, we wanted to see if you would be available for the teleconference tomorrow, April 18th from 12:00-1:00pm PST. We apologize for the last minute change. Please confirm that you are available from 12:00-1:00pm tomorrow and will be joining in the call. Seems to me they probably want to divert selected people from the real teleconference at 10:00. Anyone interested in using the pin no mentioned above could try both times. 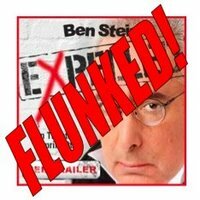 Unfortunately due to unforeseen circumstances, we will have to cancel the teleconference interview scheduled for today with Ben Stein. We apologize for any inconvenience this may cause, and thank you for your continuing interest in the film. They appear to be in a complete mess.